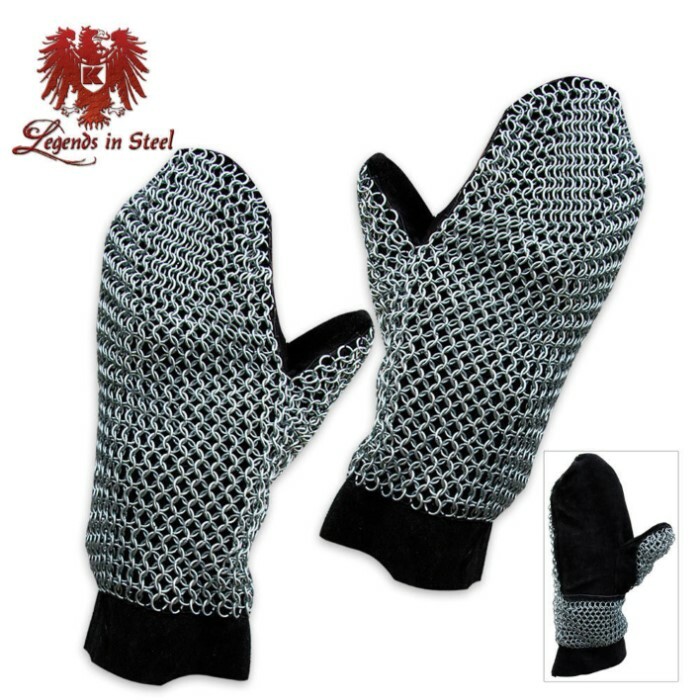 These padded chainmail mittens are constructed like the originals worn by knights at the time when fingered gloves were too difficult for craftsman to construct. Each mitten is constructed with zinc-plated 18 gauge steel in the traditional 4-in-1 linked pattern. They are lined in leather for a comfortable padded wear. My sword brother Sir Wulfscyld bought these for his fight kit. He's trying to upgrade it to a more historical look for our era, and to be more protective than his leather gauntlets. He was very pleased and wore them over some padding most of the last meeting of our group so that he could get used to them. The only downfall he saw was when one of the little girls handed him a birthday cupcake with the paper still on it. Mittens just don't work for some things. Ha ha ha. I got two pairs of gloves, they're very sturdy but on both pairs of gloves the left hand was sewn wrong at the tips which crunched the fingers closer together and soon the string holding it to the metal will tear off at that point on both gloves. I'm basically going to cut it and super glue it. I was prepared for the worst. What I got was very good. For $31 inc postage, I have a great pair of chain mitts. There's a lot of room inside, meaning I can wear another pair of gloves inside with some padding. The gauntlets protect from cuts without any padding but the impact of a 3mm edged re-enactment sword can still be felt, painfully so, try to get some padding inside these. They are not that heavy, and provide a lot of coverage. With a cross-guard on a sword, hand defenses are good with these. Lighter than my steel gauntlets and less likely to lock in right ochs or left shrankhut position. If there's any negatives with these, only time will tell. For smaller hands, there may be too much room. In time, the sewing that attaches the mail to the leather might come loose with lots of use, but this is possible with any mail sewn to leather. Very pleasing and practical.